Imagine Bambi running through the forest fire screaming "AAH! AHHHH! Woah-oah!!! AHHH!". That's exactly how it would go if the film were made today. It seems impossible for animated characters to keep their mouths shut while in danger anymore. I remember watching Speed Racer as a kid and making fun of how Speed was constantly yelling "AAHH!! WOAH-OAH!!!" Why race cars if it frightens you so much? Speed's yelling stood out because no other cartoon characters did this - not Wacky Races, not Jonny Quest. But all that's changed now. AAAAAH!! I have boarded chase sequences and pleaded with directors to not have the characters screaming "Whaa--aaaaH!!! Woaaahhhh! YAAAAAA!" They never listen. But I am right. There is nothing - NOTHING - entertaining in watching someone in peril hollering nonstop. There MAY be entertainment to be had in hollering at the right time, but when it is nonstop it loses all impact and just becomes a big sound crap. So stop. As chase sequences get longer and longer, the shouting becomes particularly annoying. A director who I'll call Chauncey Gardiner once asked me to time the climactic fight sequence of Robin Hood, the Errol Flynn version, because he thought it was a good, tight sequence. It was about 2 1/2 minutes with no one yelling AAAAHH!!!. Our sequence ended up somewhere around an exhausting seven minutes with lots of AAAAHHH!!!. I could just scream. The Robin Hood sequence was great because it resolved the story succinctly. You came away satisfied the villain got his comeuppance while providing large scale action. Erich Korngold's score is brilliant, and you can listen to it unencumbered by characters screaming "AAAAAAHH!" Why Chauncey identified this sequence as a source of inspiration, then completely ignored what made it great, is a mystery to me. Maybe what he meant by it being a tight sequence is that it was a sequence done in tights. Live action films are just as guilty of superfluous screaming, but I don't work in live action. Please, PLEASE, colleagues, lay off the screaming. More score, less "AAAAHHH!!!" I'll have to take note of this for the future! 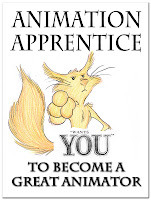 I've always wondered whether this has anything to do with the way animation directors work with voice actors. We animators are pretty far downstream from the story/editorial phase of the process, so I've got zero insight into how it actually happens. But it often feels like the director or editor is trying to compensate for what's missing in that phase-- some nuance of acting or movement, maybe, something that's hard to convey in boards-- and fills that void with dialog to make sure the idea is clear. The best directors are wise enough to trust that it will be crystal clear, dialog or no, once the animators are done with it! For sure it happens most frequently in shows that call themselves action adventure series. I've worked on many shows that are like you describe. Even Scoobie Doo was famous for dumb stuff like they always 'Let's get out of here Scoob!" when the monster is rushing in on them. As if you need to scream exactly what is you are seeing. Action adventure animation writers are about the worst writers around. Storyboards on action adventure shows always depict people with hugely gaping mouths and bugging eyes in almost all scenes. So what happens is that the recording directors and dialog editors see those big open mouths and it's there job to fill that big ugly mouth with some sound even if there is no dialog written. I would say it is a problem with the genre and the way action adventure animation is so formulaic.